MicroSummary: At the moment, “The Everything Store” is the closest thing we have to a biography of the richest person in the world, Jeff Bezos. Based on hundreds of interviews with him and the closest members of his family, the book details the rise and rise of Amazon.com, the online retailer of today and tomorrow. Jeff Bezos dreamed of creating a virtual store selling everything from A to Z. To fulfill his dream, he decided to explore the bookstore by opening a startup you probably know called Amazon. Quickly, Amazon surpassed all market expectations, faced the dot-com bubble and began to beat the competition and grow at high speed. Pricing for quality and low prices for the consumer, Bezos managed to build a great success, the largest e-commerce company in the world. If you want to know more about this fantastic story and learn the secrets of visionary Jeff Bezos, we suggest you devour this microbook! What’s the first thing you think about when you hear the word ‘Amazon’? Some might immediately think of the mighty river and rainforest of South America. But for the majority, it means the vast online shop filled with any product imaginable, and some of the Kindle. 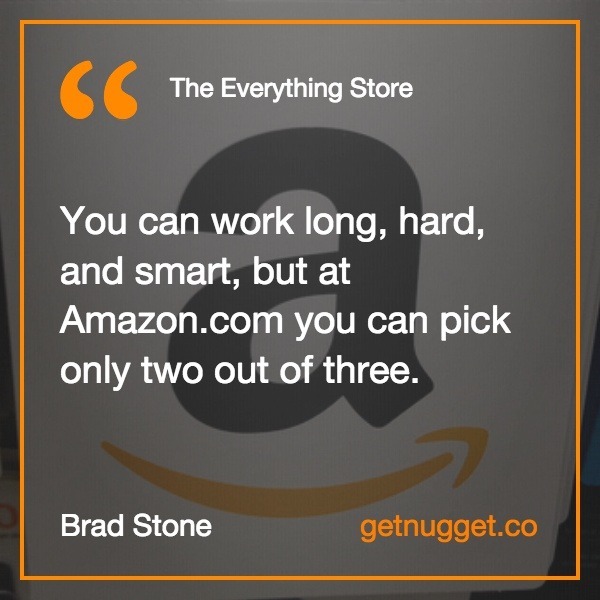 The Everything Store describes the rise and rise of Amazon.com and its founder, Jeff Bezos. Brad Stone does what every journalist does: research and present the facts. The Bloomberg Businessweek’s senior writer has had a brilliant career as a journalist. He started at The New York Times as a reporter. His columns cover subjects in business and technology. The Everything Store: Jeff Bezos and the Age of Amazon is his second book. It’s a New York Times and Wall Street Journal best-seller and 2013 Goldman Sachs/Financial Times Business Book of the Year award winner. Take Kaphan for example. His job was simple his duties – complicated. He is a programmer at Amazon with one purpose in mind – To follow his vision a recently called “primary technical steward,” and make things happen and function properly. Bezos however, is the star of the show, he alongside with other associates promised Kaphan that he could do his thing without being suffocated by control measurements. This is only one of the cases that you are not familiar with. It seems like “The Everything Store” is not an ordinary book which covers the journey of a successful entrepreneur and its ups and downs. It counters the contradictory attitude of many people in business and refers to respect as a matter that must be taken seriously. Many companies lack respectfulness towards their associates; Brad Stone presents the concept of team-leadership as a tool for prosperity. It’s a thoroughly researched book, based on many interviews carried out with former employees, collaborators, and family members. We’re able to almost follow the minute-by-minute developments of the events. The Everything Store’s written in an easy-to-read style, but it’s full of technical details. Brad Stone also presents the individuals interviewed as authentically as possible. Somebody else can sell it cheaper than us, we should let them and figure out how they are able to do it. It all started with Jeff Bezos. His name has become synonymous with his creation: Amazon.com. Jeff Bezos is a phenomenon. He already stood out as a student, due to his intelligence and tenacity. His mother and grandfather had a huge role in forming the person he eventually became. They offered him all the emotional and material support he needed. His grandfather taught him discipline, work ethics, and creative thinking. He had seen firsthand how technology, patience and long-time thinking could pay off. Brad Stone sensationally depicts historic events that happened not too long ago. We find ourselves on the threshold of the 21st century. Modern business philosophy replaces the old, traditional one. Tremendous changes take place almost out of the blue. Those who can embrace the new challenges have the future in their hand. It is the freshman years of Google, Apple, Microsoft, and e-commerce. 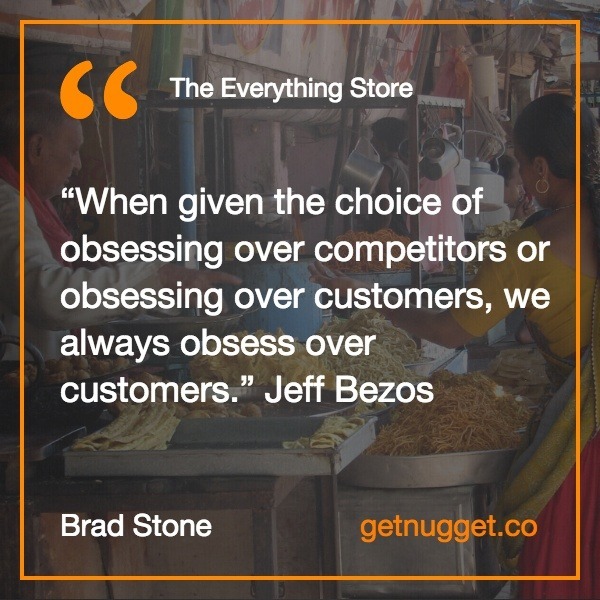 Against some of them, Bezos battled to win customers. The Everything Store also offers an intrinsic view of the harsh business world. Jeff Bezos’s ambitions were high from the start. He wanted Amazon to become a technology company, not a sales one. As a businessman, he’s described as disciplined, innovative, and a workaholic. Amazon’s success isn’t incidental; it was built meticulously. Originally Bezos had specialized his business on selling books. High standards were applied from the start in work, service, and ethics. He also had a burning desire to improve, to be one step ahead of the competition. Bezos applied one of the first rules of modern philosophy: keep near you those who take out the best of you. Always plan for the long term. Learning is a lifelong activity. Don’t be blinded by small aspects when making a big decision. Be an inventor, not a follower. The best idea always thrives – in other words, “the reality in Darwinian survival in the world of big business”. These and other non-written rules – or “Jeffisms” – run the megastore. Amazon became one with its founder. Bezos’ managerial fingerprint is present all over the organization. He constantly monitored his rivals, often met with them and tried to come to an agreement that benefited both parties. Of course, Bezos hoped the deals would be slightly more beneficial to Amazon. Are you considering applying for a job at Amazon? If the answer’s yes, you should know a few things. Controversies about Amazon employees’ rights raged in the international press not long ago. Jeff Bezos was known as a brilliant strategist and showed signs that he was building a promising career in the financial market. At age 29, working on Wall Street, he had already impressed many people with his determination, grit, and high IQ. Impressed by the growth in accesses and the internet user base, he decided to resign from that cool job to focus on his vision of business, a company that sold everything through the world wide web. Bezos could not contain his enthusiasm when he saw the growth of the internet in a very short period. However, he knew he would not be able to operate everything on a grand scale in the beginning. So, after making a list of various categories of products he could sell, he decided to focus on the books. It was a fact that he could develop a company that could stock more books than any other publisher. After creating a business plan, he founded Amazon in his garage in Seattle. Amazon’s concept was very simple and to the point. They sold books over the internet and charged customers for their credit cards. The books were delivered to the buyer’s house a few days later. The site also allowed customers to rate the books and give a score between 1 and five that was visible to other customers. Gradually the model proved itself and demand grew. Jeff’s focus then turned out to be becoming a big, fast company. It seemed impossible, but the motto began to work as a motto for the company team. ‘Get Big Fast’ was a phrase repeated by everyone, all the time. Soon, Amazon moved from its humble garage operation to a much larger space in Seattle. Very quickly they sold books to clients in all American states and even internationally. At first, Amazon’s employees wrote most book reviews. Bezos wanted his employees to be honest about their opinions, which from time to time naturally led to negative evaluations. One publisher called Amazon and explained that it worked selling books, not discouraging the sale of books. Bezos saw this in a very different way. He replied that Amazon was in business to help customers make the best buying decisions. With the emergence of innovative ideas, Bezos found himself with the owner of Starbucks, to establish a physical presence in the market. However, the deal did not work since Starbucks wanted at least 10% stake in Amazon and Bezos did not want to give more than 1% of the company’s shares. Amazon has grown to be a major competitor to many businesses, especially to large bookstores, and by no means surprising, the company has experienced nearly 10-fold growth in revenue in the second year. Bezos continued to look for different areas to compete. One of Amazon’s early strategies was to provide superior products. Realizing that he could sell other products, the company began to expand rapidly, making it difficult for others to follow. Going through a period of planned growth, the bookstore became “the store of everything.” They also introduced a new application on the site that analyzed customers’ shopping habits and made product recommendations. This amazing software made consumers happy and accelerated growth even more. Although Amazon was not yet a profitable company, it managed to raise about $ 1.25 billion in investments. Bezos read Sam Walton’s “Made in America” and believed that it was possible to make Amazon operate as WalMart, a company that was highly efficient in its operating methods. Amazon also opened a patent for a one-click purchase process, in which customers could buy products very easily. Customers loved Amazon. Also, Amazon also noticed the Ebay’s potential, another successful e-commerce space. Bezos approached eBay managers trying to join forces, but the partnership did not happen. In 1999, Amazon was starting to pick up, doubling its sales that year and reaching 3 million customers. In the early 2000s, the internet crisis had wiped out thousands of companies. However, during the so-called bubble dot.com, Amazon survived. It was a time when the economy was in a mild recession, but Amazon managed to raise $ 672 million worth of funds from investors. Bezos was committed to stop expansion and growth at any cost and focus on increasing the financial efficiency of the company. Amazon overcame turbulent problems in this period, thanks to reports by financial market analysts. Bezos was a master strategist and focused on studying the business models of successful companies like WalMart and Cosco. ‘Economy’ became the motto of Amazon, which began to cut costs in every possible way. Like WalMart, Amazon stopped marketing campaigns and focused on providing products at a cheaper rate. Low prices were the marketing strategy, and cheap products attracted more and more customers. Obsessed with providing the best services to customers, Bezos also decided to sell the Harry Potter books at a discount, even when doing so would hurt the company. These titles were extremely popular, and in doing so, Bezos attracted new customers and grew faster. It was cheaper to lose a few cents in each book sold than to invest a few dollars in marketing to attract new customers. Lower prices have become the definitive marketing strategy for Amazon. Jeff Bezos is known for his intolerance of incompetence. Also, many say that he is a workaholic and a boss who puts a lot of pressure on his employees. As Amazon struggled to manage its finances, Bezos continued to hire new employees for his new business because he knew that persistence and patience could change the game. For this, he had two key weapons. Hard work and his ruthless feedback to his employees, which helped him to get the best out of people. It is believed that this ambitious profile and the need to prove himself formed early when, as a child, he was separated from his biological father. The author states that, as with Steve Jobs, these events in childhood end up creating a great need to become successful and accepted. Bezos is also a fearless leader who is ready to take risks and make bold and unconventional moves. Even as a child, Bezos was very determined. He might seem indifferent to people in some cases, but he soon learned that kindness was an important quality. His grandfather used to say that it was harder to be kind than to be clever. Jeff believed and repeated this. As Bezos grew up, his passion for space exploration increased. Later that passion would drive Jeff to create Blue Origin, which is dedicated to space research. After Amazon survived the dot-com bubble, the company began venturing into several new categories. Bezos did not give up and bet even higher, following his initial vision of a store that sold absolutely everything. More than just books, Amazon would now go from A to Z in everything people wanted to buy. However, with the growth at an insane speed, the company began to face problems of collaboration between the people of its team. That’s why Jeff Bezos invested in improving the company’s culture and creating something different. Amazon’s practices are different from other startups. For example: On Amazon, no one makes PowerPoint presentations to convince people of a new idea. Instead, employees should write six-page articles explaining their ideas, which should be read by all meeting participants, including Bezos. They have up to half an hour to present your document. Bezos believes that, in this way, people think better of their ideas and manage to present them in a more efficient and refined way. Another cool aspect of Amazon culture is the so-called “two pizzas” rule. No company team should have too many members to need to order more than two pizzas to feed it. Bezos believes that big teams are not productive and that’s why the whole company is organized in autonomous units of up to 10 employees each. Another critical point for Bezos is to simplify communication in the company. Bezos tries to ensure that the organization is decentralized, where small groups can develop ideas on their own. Instead of spending time brainstorming sessions with many participants, the idea is for small groups to come up with solutions alone, without involving outside resources and with agility. 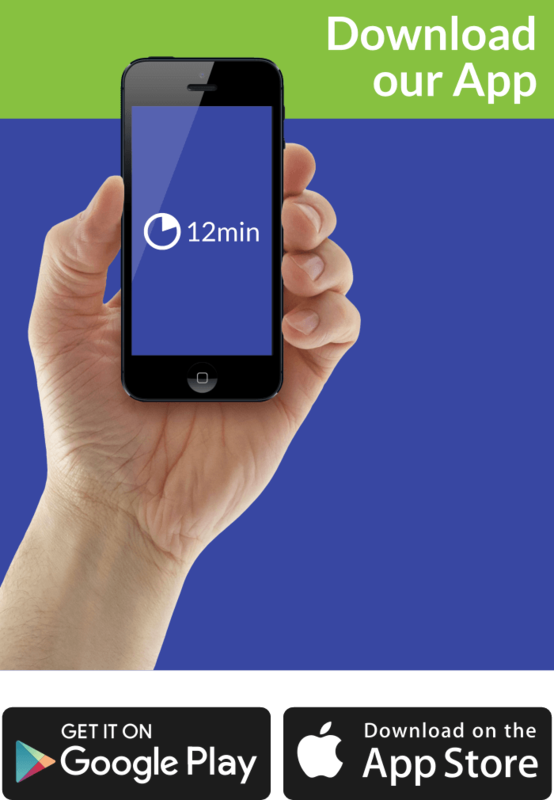 With this, small teams can quickly implement ideas, which benefits the client. Also, Amazon also developed techniques to build its software, focusing on increasing efficiency and speed of the company. Very soon, Amazon executives realized they did not have to give up distribution, but they had to reinvent it. Its distribution centers and warehouses use its own technologies that give the company a clear competitive advantage over other major retailers. Bezos is also obsessed with impeccable customer service. Bezos wanted to give his customers the prices of Walmart, with the assistance of Nordstrom. That made the company loved. Realizing that customers were increasingly pricing their speed, Amazon also started a program called ‘Prime’, a delivery option that allowed consumers to get products faster for added value. This service did not make a profit, but its purpose was to make sure that Amazon was an exclusive online shopping site for its customers. The following year, they invented Amazon’s logistics network. This service allowed shopkeepers to store their products in Amazon warehouses and let Amazon take care of storage and delivery to customers instead. As a result, the retailer reduced its costs, and the products began to arrive even faster to the customers. Although Amazon struggled for dominance in the retail business, it was always behind when compared to technology giants like Google. Bezos always insisted that Amazon was not just a retailer, but an e-commerce company that paved the way for major technological breakthroughs. Gradually, the company launched ever-greater innovations such as Mechanical Turk, a service that allowed people to hire others to do repetitive tasks on the internet. Also, Bezos was a book addict and continued to learn from other entrepreneurs. He always looked for ideas in business books that would help him to have ever lower prices and thus more growth. Bezos, as a voracious reader, realized that the potential of the e-book market had not yet been explored by large companies. Internet. Passionate about the subject, he envisioned an interesting project: to create a device that would allow customers to read e-books anywhere. To make this project feasible and have a vast catalog of titles, Amazon began to negotiate contracts with several book publishers, always talking about the advantages of the digital book. Without printing and logistics costs, book prices would fall dramatically. When Amazon introduced the Kindle, publishers were not too impressed with its simple design, lack of color, and the technical problems of the first-generation device. However, Bezos was a visionary and already saw the e-books as a threat to the future of Amazon. They cannibalized Amazon’s own book sales, and so he needed to win in the digital book world. The project was further accelerated after Bezos saw what Steve Jobs and Apple were doing with the music business on iTunes. Bezos preferred to cannibalize his own products than to let Apple, Google or any other competitor do so. After making several changes and improvements, Amazon finally unveiled the Kindle, which was born at a price of $ 399 and would serve as the perfect tool for its book passionate customers. Bezos was obsessed with the lowest price, and so he set up a team that constantly watched its competitors. If the team found that a competitor was selling a product at a lower price than Amazon, Bezos was researching and reducing costs to win. For example, a new company called Zappos was starting to make a name for itself in the clothing and shoe market. To deal with Zappos, Bezos insisted on launching a new website, called ‘Endless’, which would deal only with shoes, handbags, and clothing. With lower prices, returns and free exchanges and one-day deliveries of Endless, Zappos encountered difficulty and Amazon eventually bought the deal for $ 900 million. Amazon launched the second version of the Kindle in 2009, an improved version of the original 2006. At that time, Amazon also noticed another rising company known as Diapers.com, which sold baby products to mothers. With advanced technology and software, the company offered free deliveries to most of its customers. In response, Amazon was interested in the diaper market and aimed at Diapers.com. The idea was to sell diapers at a lower cost than Diapers.com, causing a great competition and consumers to come to Amazon. Amazon would offer lower prices until Diapers.com could no longer sustain its business and go bankrupt. Just like it did with Zappos, Amazon bought Diapers.com for $ 540 million. Obviously, these tactics were not new to Bezos, and he had won again, forcing his competitors to reduce prices and sell their companies. 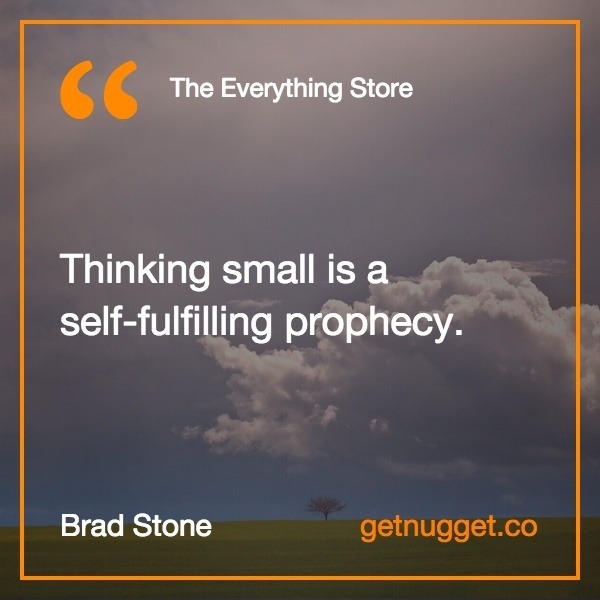 As part of his research to write The Shop of Everything, author Brad Stone tracked the biological father of Bezos, Ted Jorgensen, who had set up his bicycle shop. Surprisingly, Ted had no idea that his son was very successful, although he tried to contact him sometimes. Bezos was always silent when he received numerous emails from Ted and avoided meeting the father who had abandoned him. Years later, Bezos sent an e-mail to Ted’s son to reassure him and get to know him. Being reassured about his problems, Jeff Bezos always sought to continue moving toward success. Amazon is famous for its aggressive nature since Bezos believes that the best ideas appear when they are placed against each other, even violently. While many employees do well in this type of environment, others do not withstand extreme pressure. Several workers have complained that the atmosphere is volatile, while others have reported that they loved learning opportunities. Although some employees insist that working conditions are terrible, Amazon had 88,400 employees working in 2012, and its brand was in almost every category, selling industrial materials, wine, art, clothing, and more. Amazon’s future, like its history, promises to be interesting. It is evident that Bezos has changed numerous business dynamics in the world. He ignored traditional techniques and did just the opposite, forcing other people to adjust or to give up on business. The Everything Store shows there was some proof behind those claims. Bezos has high standards not only for himself, but for his staff too. Mistakes aren’t tolerated. Underperforming workers, or those who struggle with burnout, are often let go. Life-work balance doesn’t exist for Bezos. We shouldn’t be so surprised about this mentality. Today’s multinationals are under a lot of pressure. To deliver high quality in a constant manner, as fast as possible, puts every single employee to the test. And, after all, we are only human. Mistakes do happen. Many business owners have what Bezos possesses. What’s the crucial difference between remaining average and becoming successful? After reading the book, I would say cold-bloodedness. The early years of the Internet were quite turbulent. Add to this economical fragility, even a recession, and the whole Y2K hysteria. Other business-related problems were endless. Navigating through all of them successfully requires not only intelligence but outstanding boldness too. Constant improvement led Amazon to become what it is today. From workers to corporate heads, everyone was invited to share ideas for improvement. They received a gift, sometimes more of a symbolic one. In time, new products or services requested a room on the e-shelves of Amazon. One of them is the Amazon-produced Kindle, the indisputable market leader for e-readers. These kinds of products or services were designed to monopolize the market. Sometimes the exasperation of its rivals led to the courtroom. They were treated the same as less-effective Amazon employees – without mercy. Amazon has ascended to the top of the mountain of almost untouchable businesses, along with Google, Apple, and Microsoft. It grew from a humble site selling books to an online behemoth offering almost any product and service under the sun. Was it worth it for Bezos? Does customer satisfaction come first for him? We can indeed benefit from discounts, a vast selection of products and home delivery (even next-day delivery). These aspects make our lives much easier. But is this what we really want? And what’s the price we actually pay for it? I strongly encourage you to read The Everything Store and decide for yourself.